What if all your marketing and sales initiatives lived in a complete, versatile and easy-to-use platform? Sound too good to be true? It was until HubSpot launched a feature-rich inbound marketing, sales and customer relationship (CRM) platform designed to accelerate growth and boost productivity. 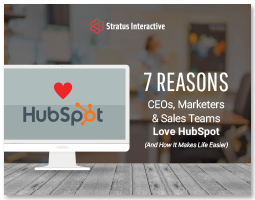 Learn why so many businesses are adopting HubSpot to create ridiculously effective marketing and sales campaigns and surpass their revenue and growth goals. Fill out the form, and discover the benefits of a powerful, all-in-one marketing and sales platform.